Get an in-depth exploration of the stone city of Gjirokastra on this full-day tour. 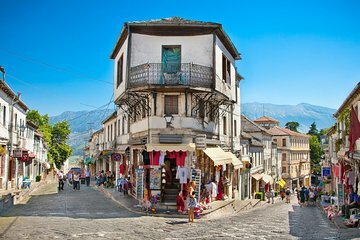 In the company of a guide, travel in a private vehicle throughout Gjirokastra and learn about its history. Visit Gjirokastra Castle, the medieval bazaar, the Museum of Weapons, the fortress, and more. Hear stories about the communist dictator Enver Hoxha and the writer Ismail Kadare, who both had roots in Gjirokastra.